Projector lamps, also known as projector light bulbs or projector bulbs, are one of the few user replaceable projector parts. 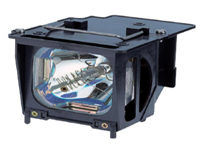 There are several different projector lamp technologies of different wattages. Be sure your projector light bulb matches the one you are replacing as each projector is designed to use a specific type of lamp and a specific wattage. Consult your user's manual for information on replacing the lamps. Lamps should be treated as hazardous waste and disposed of accordingly. Projector lamps need to be kept in a dry, cool, dust free environment to maximize lamp life and minimize operating cost. A common trick is to leave your well-circulated fan on after use until the projector is cool. Do not obstruct airflow or you can burn out your lamp, or even worse. Lamp brightness is essential to picture quality, so it is extremely important to maintain your bulbs and refer to your projector guide to determine the lamp life expectancy. As a lamp nears its end, dimming may occur. There two common projector lamp types: Metal Halide Lamp, and the Halogen Bulb, each with their positive and negative qualities. The Metal Halide Lamp is superior and used for medium to high-end projectors. One downfall are that these lamps lose brightness after use, where Halogen Bulb's maintain their brightness while only lasting 40 to 70 hours compared to Metal Halide at 1,000 to 2,000 hours. Some of these lamps are being advertised at 4,000 hours. Halogen Lamps are yellow compared to the Whites that make Metal Halide a superior technology.